There is more to a vacuum cleaner than it meets the eye. Recently, more and more people started investing in a cordless vacuum, for its obvious and less obvious benefits (see here). And since I needed a replacement for my old vacuum, I went cordless too! Did my usual research, minding all vital features and characteristics of a quality cordless vacuum. 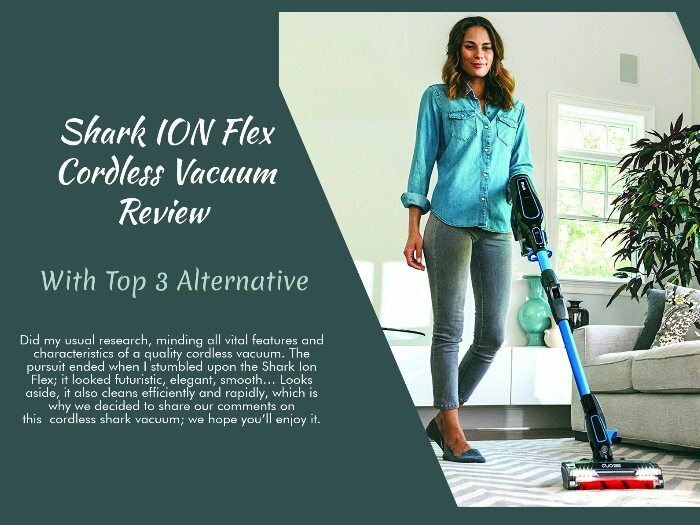 The pursuit ended when I stumbled upon the Shark Ion Flex; it looked futuristic, elegant, smooth… Looks aside, it also cleans efficiently and rapidly, which is why we decided to share our comments on this cordless shark vacuum; we hope you’ll enjoy it. The most obvious benefit of having a cordless vacuum is the fact that it is, well, cordless. Cordless vacuums allow more convenient and rapid cleaning because you aren’t dragging a cord alongside you. This is particularly annoying when you are cleaning the stairs of upholstery. Cordless vacuums are also generally lighter than the corded vacuums. Furthermore, it is much safer to clean your home with the cordless vacuum because you don’t have to worry about people stumble over the vacuum’s cord. However, you will have to charge the battery. Many vacuum cleaner manufacturers struggle with making a quality battery system, which is why you need to pay close attention to it if you decide to buy. On the other hand, it is convenient that you don’t have to worry about electrical sockets. However, should you buy it; should you buy a cordless vacuum cleaner? Well, that depends on your needs. If you vacuum cluttered spaces, tight areas, upholstery or stairs, then yes, you should probably opt for the cordless vacuum. Of course, you need to make sure that you buy the right one. While cordless vacuums have their benefits, they have flaws, and you’ll have to recognize those flaws if you want to feel satisfied with your new purchase. But shark ionflex is much more than that. It also has a DuoClean technology, one that is found in most Shark Rotators and Navigators. Aside from excellent on-carpet performance, this vacuum was also designed to allow more straightforward above-floor cleaning. 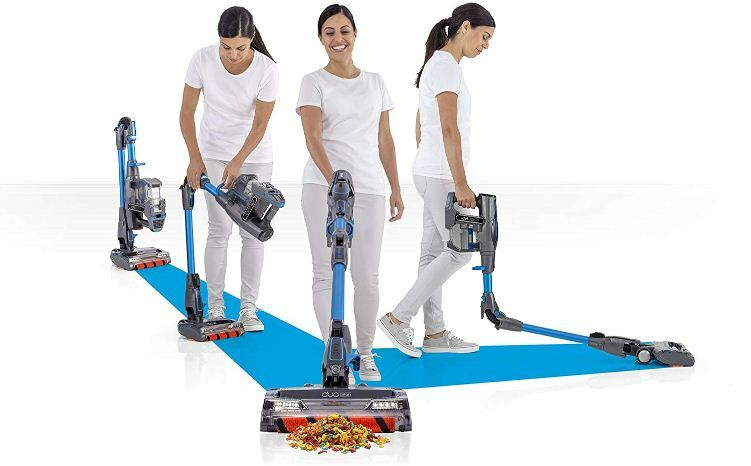 Thanks to its design, it rapidly transforms into a handheld vacuum cleaner, making stair and car cleaning much more convenient. It also packs some additional accessories; crevice tool for close-to-wall cleaning, an extensive tool for cleaning upholstery, hypoallergenic dust brush and of course, a battery with charger. Most importantly, Shark ionflex 2x (Check the video to see how it performs) is soo convenient and flexible, allowing you to clean your home rapidly and free of frustration. Excellent for vacuuming pet hair. Can be hard to navigate (especially for those that are new to Shark vacuums). The charger can charge only one battery at a time. We will approach this vacuum from the inside out. First, we’ll explain its design, the way it moves and feels when you use it. Then we’ll proceed to the way it works and answers questions regarding durability, efficiency, usability, and so forth. The Shark IONflex DuoClean vacuum is 13.4 x 10.4 x 45.9 inches large and weighs 8.7 lbs (with all attachments and dustbin.) The product has a 0.3-quart dustbin and arrives with two batteries (hence the 2X) and a charger. This vacuum merges two technologies, SmartFlex and DuoClean, and delivers a cord-free vacuuming, simple safekeeping and inexpensive maintenance. Upright Mode – this mode implies the use of added-in soft brush roll that not only makes vacuuming more efficient but also allows the vacuum to transition from surface to surface smoothly. Reach Mode – SmartFlex technology delivers a very flexible wand that can bend and make it easier for you to vacuum under furniture. 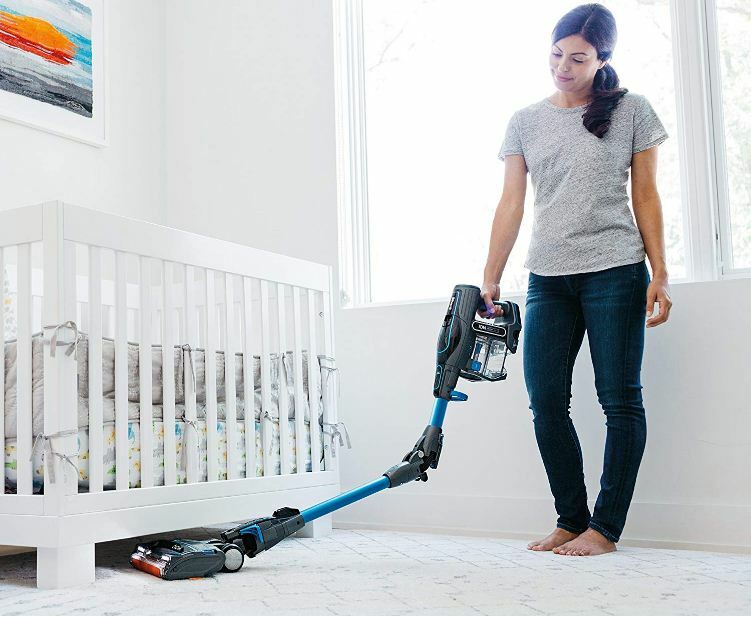 Above-Floor Cleaning Mode – lastly, this vacuum can be used in an above-floor mode to clean the corners, walls, and shelves with convenience and comfort. The Shark IONflex is potent and durable. It derives its power from the included Lithium-Ion battery. You receive two batteries, both of which are removable and rechargeable. The fact that you get two batteries also means that you’ll have one fully charged battery at your disposal. Should you run out of power during your cleaning crusade, you can swap them with ease and without any hassle. A soft brush roll that is in direct contact with the floor. The vacuum uses this brush not only to vacuum floors and large particles but also to collect give it a fresh look and a sense of cleanliness. Of course, cleaning performance is also significantly affected by the use of attachments. They are all quality made and serve a unique purpose, and you should use them appropriately. For instance, the crevice tool made it so much to clean tight spots, corners, and wall. We also commend the integrated LED lights, which make it easier to vacuum in dark spots and areas. They also affect the vacuum’s appeal, making it look very stylish and futuristic. As you already know, Shark IonFlex is a cordless vacuum. It uses the battery as its primary and only source of power. Extended Runtime: in this mode, the vacuum will use less power but also clean less efficiently. In this mode, the battery usually lasts 20 minutes. Now keep in mind that the runtime is much affected by the modes we already mentioned (Upright, Reach and Above-Floor Cleaning.) For example, if you use this vacuum as a handheld vacuum in combination with Extended Runtime, it can vacuum 20 minutes. However, if you use it in an Upright Mode in conjunction with Extended Runtime function, it can vacuum for 15 minutes. You can switch between these power functions via the at-fingertip control board (see the video) which is built in the vacuum’s handle. On the handle, you’ll also find the switch for floor or carpet cleaning. Aside from being cordless, Shark ionflex is also free-standing. Thanks to the SmartFlex technology, the vacuum can stand on its own without the support of other objects. Now all these benefits (cordless, rapid battery exchange, fast charging, and SmarFlex technology) are implemented to take vacuuming on another level. This vacuum feels like no others because of its smooth and easy-to-navigate design. It crosses from the surface to the surface without any issues, and more importantly, you can adapt to floors and carpets with a single push of a button. While it is suitable for floors and carpets, we have to say that it performs amazingly on carpets; it is suitable for cleaning floors but fantastic for cleaning carpets. It is also an excellent option for pet owners, thanks to the DuoClean technology. Add in the fact that this vacuum is light and flexible and you’ll get a more uncomplicated and hassle-free cleaning of carpets, pet cages, and pillows. Plus you’ll be able to clean your vehicle in no time! Here is the list of three alternatives to the Shark IONflex. 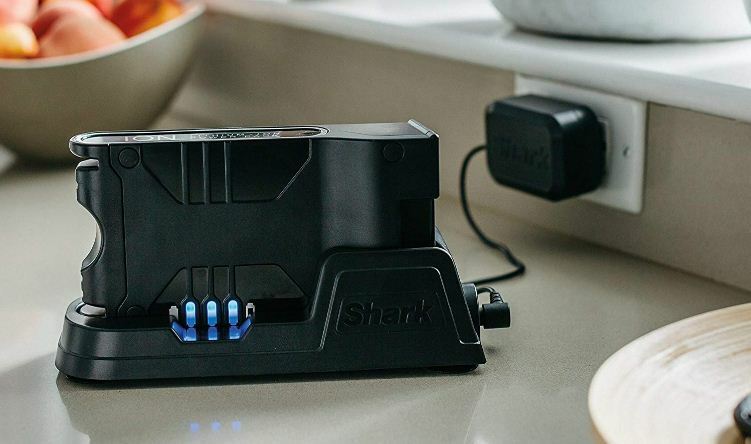 And btw, keep in mind that there is a difference between Shark IONflex and the Shark Ionflex (the arrives with two batteries, and with more attachments.) For more info regarding the difference between these two vacuums, refer to the Shark 201 vs 251 articles. The Shark Rocket HV382 is similar to IONflex. It features the same DuoClean technology, it has LED lights and is excellent for pet owners. It is also very lightweight and convenient to use. However, it doesn’t feature SmarFlex technology and is less flexible in that regard. It is also corded, so it doesn’t bring with it all the benefits of cordless vacuums. Nevertheless, it is a reliable alternative to the IONflex; you can find more information about it here. Better performance with pet hair vacuuming. 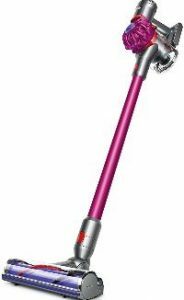 Dyson V7 is a slightly more expensive cordless alternative to the IONflex. It has longer runtime (30 minutes,) but offers less flexibility and maneuverability. It does transform rapidly to a hand vacuum and is very comfortable to use. While it does perform better on floors, it isn’t an ideal pick for pet owners. It does arrive with cool attachments, but so does the IONflex. 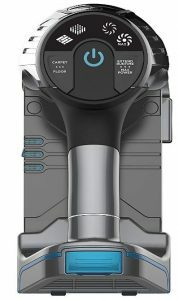 If you need detail information then you may go here for detail review of Dyson V7. Dyson V8 is a cordless vacuum cleaner with an excellent runtime ( up to 40 minutes.) Its design is similar to that of the V7, though the V8 comes with slightly more sophisticated attachments. It arrives with the Mini motorized tool, which is perfect for cleaning pet hair. And unlike V7, V8 uses HEPA filters. While it is more expensive than the V7 or IONflex, V8 is a better pick for pet owners and those that seek cordless vacuums with extended runtime. For more info regarding V8, click here. For us, it was a pleasure reviewing it. The vacuum is cordless, smooth and attractive. It is a perfect pit for those that seek an affordable cordless vacuum, especially for those that have pets. If you liked it for its sophisticated design and excellent all-surface cleaning performance, you could click here to explore it more deeply and personally.